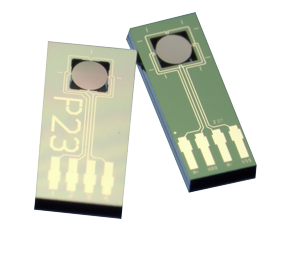 The NANOSENSORS™ MSS is a non-packaged MEMS sensor: a silicon membrane platform supported with four beams on which piezoresistors are embedded. 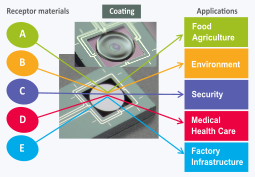 This nanomechanical sensor is primarily designed for the following two R&D fields, but can also be used for many other exciting applications. The MSS has a great potential as a core component for olfactory systems, gas/odor sensing, electronic (artificial) nose systems utilized in e.g., medical, food, environment, safety and security fields. A receptor material coated on the membrane determines the sensitivity and the specificity of the individual sensor. Researchers can create an original sensor. The MSS can be used for assessment of various materials like organic conductors, magnetic and superconductor materials in torque magnetometry. A vertical force generated by the sample can also be measured. 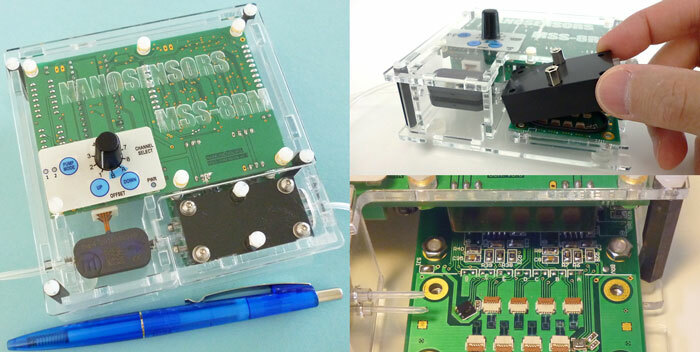 Researchers can create their own electronic module to collect the numerical data of the sensor responses or acquire the NANOSENSORS™ MSS-8RM. 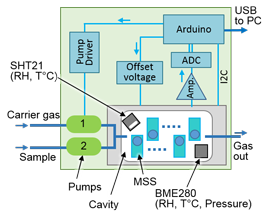 The latter is a basic electronic module to operate and to readout NANOSENSORS™ MSS that can be integrated in the researchers own set-up. SD-MSS-1K and SD-MSS-1K2G, both have a 1mm-diameter membrane and are suitable for R&D in the field of gas/odor sensing. The main difference is the membrane thickness and the die footprint. For gas/odor sensing, the membrane is coated with a receptor layer sensitive to e.g., volatile organic compounds (VOCs), which determines the sensitivity and the specificity of the individual sensor. The coating is done with e.g., inkjet spotter, spray coater, or manually with micropipette. Upon absorbing VOCs, the receptor layer yields surface stress and deforms the membrane, which induces resistance changes of the piezoresitors. By monitoring the wheatstone bridge output, the presence of the target gas/odor molecules is detected. SD-MSS-1KTM is specially designed for torque magnetometry and force sensing applications. 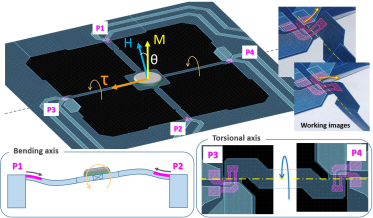 The sensing beams are long and form "bending" and "torsional" axes. Each piezoresistor can be individually connected so that users can test various measurement configurations. MSS-8RM is a USB-powered basic electronic module to operate and to readout NANOSENSORS™ MSS, up to 8 sensors simultaneously, under a hardware configuration for electronic nose/ odor sensing. MSS-8RM contains two air pumps and users can examine self-prepared MSS under different gas flow conditions. MSS-8RM is designed as simply as possible so that users can learn about a basic E-nose system and further improve the system performance. Please note that MSS-8RM does not include any data processing functions to distinguish one sample from the other. 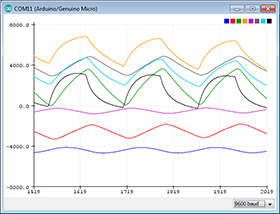 You will get raw numerical data of the sensor responses under different conditions as final output.